Kumho has appointed independent Maclean tyre dealer Moran's Service Centre as a Platinum Dealer, the latest in a growing network of tyre dealers committed to strong customer service and professionalism. Leading tyre brand Kumho has taken its Platinum Dealer program to Hervey Bay with the opening of its latest store, Rock Bottom Tyres in Piabla. A commitment to value and customer service from leading tyre company Kumho Tyre has seen the opening of its sixth Platinum Dealer in Sydney, with Plumpton Autos becoming one of the tyre maker's top shelf dealers. 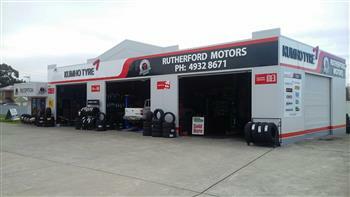 Kumho has opened its 40th Platinum Dealer in Australia with the opening of AA West Automotive at McGraths Hill. Kumho Tyre says value and customer satisfaction are the key focal points for its latest Kumho Platinum dealer which has just opened in the north west Sydney suburb of Riverstone. Leading tyre manufacturer Kumho Tyre has continued the expansion of its Platinum Dealer program in Brisbane with the opening of Deception Bay Tyre and Mechanical. Leading tyre manufacturer Kumho has continued the roll out of its Platinum Dealer network with the opening of Bellbird Tyres at Blacktown in Sydney's west. Leading tyre maker Kumho has added a second Sydney outlet to its rapidly expanding Platinum Dealer network with the opening of Smithfield Tyre Service in the city's south west. Leading tyre company Kumho has pledged to take customer service and value to a new level with the opening of its latest Platinum Dealer in regional Queensland - Maroske's Tyre Services in Murgon. Geebung based tyre retailer Queensland's Best Wheels and Tyres has become the latest Sunshine State store to join Kumho's innovative Platinum Dealer program. Leading tyre retailer Wheels n Tyres has expanded the number of Kumho Platinum outlets adding a third dealership to its portfolio with the acquisition of existing Platinum Dealer, Tyrezone Cleveland. Aldinga based Midcoast Tyres has become the latest South Australian addition to the Platinum Dealer Program for leading tyre company Kumho. The rapidly expanding Kumho Platinum Dealer network is set to turn pink in October to support National Breast Cancer Awareness Month. at 126/128 New England Hwy, Rutherford or call 02 4932 8671 at 126/128 New England Hwy, Rutherford, call 02 4932 8671.